It looks like we could see Ben Askren under the UFC banner very soon! The former five-time Bellator Welterweight champion is closer to the UFC than ever! With the MMA score of 18-0, 1 NC, Askren is one of the most dominant fighters ever. He hasn’t still fought in the UFC. But it could change swiftly! Ben Askren was asked by the fan of what the possibility is to see him fighting in the UFC. “Funky” gave an optimistic answer – 98%! Shortly after, Ariel Helwani from ESPN tweeted there are good chances of seeing Askren in the UFC. But, he also added that nothing is official at the moment. Ben Askren started his MMA career back in 2009. He signed for Bellator MMA in 2010 and set the score of 9-0. Bellator released Askren after his victory over Andrey Koreshkov on July 31, 2013. His contract expired. “Funky” was hoping to get a chance to sign for the UFC. Dana White signed WWE fighter CM Punk, who had no experience at all. But when it came to Ben Askren, White said he “needs more experience”. Askren shared his disappointment on Twitter. Dana White replied to his criticisms, claiming Askren simply doesn’t want to fight in the UFC. According to Dana White, Askren was looking for the way to increase his popularity by criticizing UFC over and over. 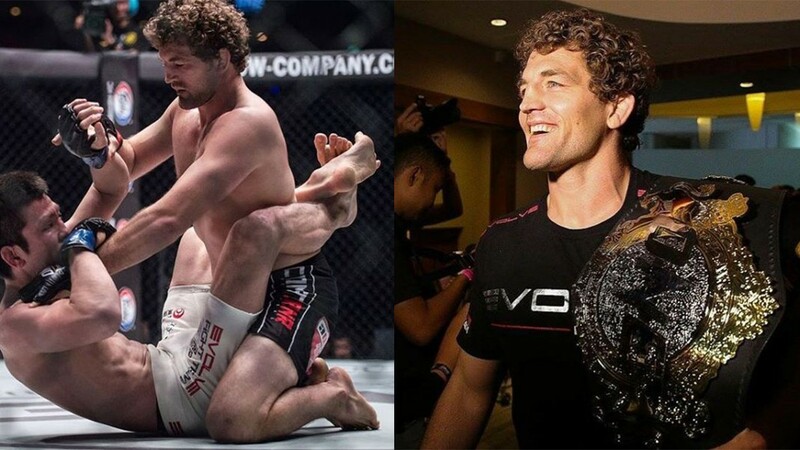 Ben Askren “semi-retired” after successful ONE Welterweight title defense on November 24, 2017. In his last match, Askren defeated one of the best submission specialists, Shinya Aoki. He needed only 57 seconds to defeat the Japanese superstar. But, Askren has never had any superfight in his career. The fight between Ben Askren and Georges St-Pierre was mentioned as a possibility. Georges St-Pierre defeated Michael Bisping at UFC 217 on November 4, 2017, and won UFC Middleweight title. Askren even called “GSP” in the past. Georges St-Pierre vacated the title after only 34 days. Yet, the French-Canadian superstar also confirmed he is interested in returning for one or two fights to boost his legacy. St-Pierre stated later he is not interested in fighting Askren because “nobody knows who he is“. There were also talks about the fight between Ben Askren and UFC Lightweight champion, Khabib Nurmagomedov. But Khabib will probably be punished by NSAC for the UFC 229 post-fight incident. He even threatened to break UFC contract if UFC doesn’t let his comrade Zubaira Tukhugov keep his job. At the moment, there is a small possibility for this showdown. What do you think? Can a fighter like Ben Askren defeat the toughest UFC superstars? His wrestling is world-class. We could bet nobody would like to end up on the ground with “Funky”!